Defense Secretary Roberts Gates and Adm. Mike Mullen, chairman of the Joint Chiefs of Staff, will appear before a Senate committee today to testify about lifting the military?s 16-year-old ban on gays openly serving in the armed forces, the first time senior military officials will argue in favor of repealing the ?Don?t Ask Don?t Tell? policy. The country's two most senior defense officials announced the first steps in repealing the country's "don't ask, don't tell" policy, which bans openly gay troops from serving in the military, calling abolishment of the law "the right thing to do." Testifying before the Senate Armed Services Committee, Defense Secretary Robert Gates announced a year-long Pentagon review of the 1993 policy, the first step towards reaching President Obama's goal of lifting the ban. "I fully support the President's decision," Gates told the committee. "The question before us is not whether the military prepares to make this change, but how we best prepare for it. We have received our orders from the commander in chief and we are moving out accordingly." Gates named a civilian, his chief legal advisor Pentagon General Counsel Jeh Johnson and a soldier, Gen. Carter Ham, who leads Army forces in Europe, to conduct the review. "The mandate of this working group is to thoroughly, objectively and methodically examine all aspects of this question and produce its finding and recommendations in the form of an implementation plan by the end of this calendar year," Gates said. In the meantime, and in effort to implement the policy in a "more humane and fair manner" Gates said the military would "raise the bar of credible information needed to institute an inquiry" and likely suspend dismissing troops based solely on third party accusations of homosexual activity. Gates and Mullen did not come to Congress with a concrete plan for repealing the ban, but rather an appeal for an open-minded discussion and plans to launch a review on how to best repeal the law. Mullen said he knows many will disagree on changing the policy and said there are practical obstacles to lifting the 1993 ban. "I never underestimate their ability to adapt," he said. Sen. John McCain, R-Ariz., who opposes overturning the law he helped pass in 1993, said of Gates' plan to overturn the law that he was "deeply disappointed." "The essence of military capability is good order and unit cohesion," said McCain who called the repeal of "don't ask don't tell" an "unacceptable risk." McCain said Congress polled troops in 1993 and found that they did not support openly gay men and women serving in uniform. He said the Pentagon's proposed plan does not adequately take into account the feelings of service members. 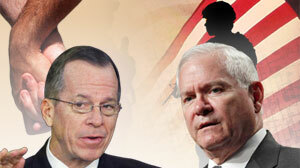 Adm. Mullen, chairman of the Joint Chiefs of Staff, said the top brass supported the repeal. "The chiefs and I are fully in support," said Mullen, who testified alongside Gates. In his personal opinion, he said: "it is the right thing to do." Mullens said the policy forces gay troops to "lie about who they are in order to defend their fellow citizens." Public and political support for lifting the ban has increased significantly since President Bill Clinton announced the compromise policy in 1993. More than 13,000 service members have been discharged from service since "don't ask, don't tell" went into effect in 1993. In 2009, some 428 members of the military, 259 men and 159 women, were discharged for violating the rules on homosexual activity, the lowest number of discharges in 30 years, according to recently released Department of Defense statistics. The two senior defense officials' visit to Congress comes on the heels of President Obama State of the Union address last week in which he pledged to "work with Congress" to repeal the ban. His announcement, supporters say, makes good on a campaign promise some of his most ardent backers felt he ignored during his first year in office. "This year, I will work with Congress and our military to finally repeal the law that denies gay Americans the right to serve the country they love because of who they are. It's the right thing to do," he said during his speech Jan. 27. Gay-rights groups were quick to applaud the plan to review the policy with an eye towards its repeal. "Today is a historic step forward in repealing a shameful law that has harmed the military, discharged thousands of talented and patriotic Americans and prevented thousands more from serving their country," said Human Rights Campaign in a statement following the hearing. Beginning of End for 'Don't Ask, Don't Tell'?